With the recent tea-drinking craze flooding social media, the numerous green tea benefits are definitely known to all. Regardless of whether your choice of pick-me-up is the robust earl grey tea or fragrant green tea, both offer immense health benefits. However, a daily boost isn’t just what tea is good for – these organic black tea bags, often thrown away, can help to power up our beauty routines. Beauty doesn’t have to be bought in a store; in fact, it’s right here in our kitchens! Read on for 5 Do-It-Yourself organic black tea bag beauty hacks that will amp up your beauty routine at no additional cost. Chamomile tea – the powerhouse of all teas. It benefits us by lowering our risk of cancer, help us sleep better and improves our brain function. Here’s a creative way of using organic chamomile tea bags for squeaky clean skin. Empty the contents of 2 loose organic Chamomile tea bags and mix it with 1 cup of white sugar and ½ a cup of coconut oil. Stir everything thoroughly, or use a blender to mix it together in seconds. The benefits of Chamomile tea scrubs are as follows: dirt and impurities are removed from your skin, and also clears off any extra organic chamomile tea bags you might find lying around. Fully utilize the benefits of organic chamomile tea bags with this body scrub! P.S: other flower teas can also be used. Instead of giving into pressure from your hairstylist, naturally lighten your mane with chamomile tea or organic red tea and organic black tea bags. Chamomile tea gives brunette hair a more golden glow with its natural yellow tones. Add two chamomile tea bags to a huge cup of boiling water, and let it cool. Then, pour the chamomile tea over freshly washed hair and let your mane soak it up overnight. Rinse the following morning and repeat 2-3 times. Feel free to do the same with organic red tea or organic black tea bags, such as earl grey tea, to add extra shine to dull hair. Earl grey tea has anti-dandruff properties as well and is great on its own as a hair mask. Sipping on a cup of organic peppermint tea instantly freshens our breath, but it can also be converted to a antibacterial mouthwash to keep cavities at bay. Here’s how: brew a cup of organic peppermint tea and let it cool before adding a teaspoon of coconut oil and tea tree oil. Store in a jar and shake well before each use. This organic peppermint tea mouthwash leaves your breath minty fresh and eliminates dental plaque. Add this organic peppermint tea mouthwash to your daily routine for healthier teeth. 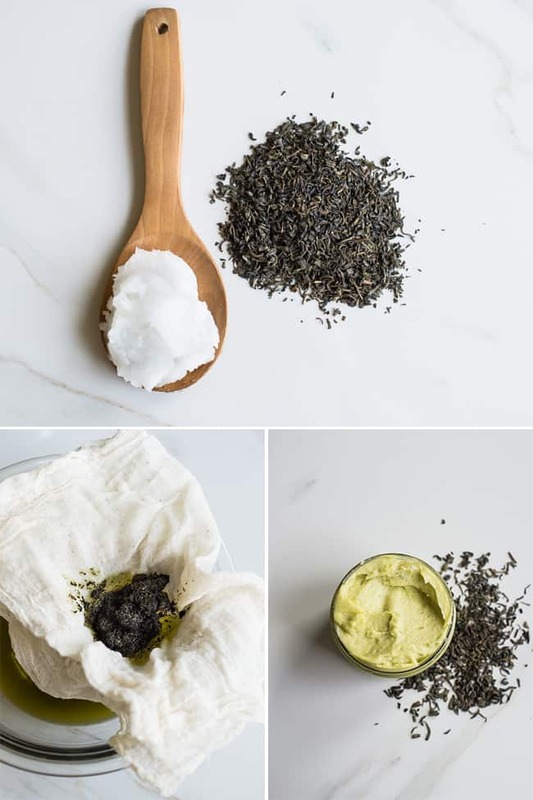 This DIY moisturizer made from loose organic green tea and coconut oil is a godsend to your dry face and your bank account; no longer will you need to spend heaps of money on luxurious store-bought moisturizers. Loose organic green tea benefits our skin by soothing scars and rejuvenating skin, while coconut oil hydrates without clogging up your pores. Organic green tea bags can also be used for this DIY moisturizer. Melt 1 cup of coconut oil in a double boiler and stir in 2 tablespoons of loose organic green tea leaves. Cover and simmer on low heat for 1 hour. Strain the loose organic green tea leaves from the oil, and let it cool until solid. Whip the mixture until it has a cream-like consistency and store in the refrigerator. While all of us might have been familiar with green tea benefits, not many know of the numerous benefits of other herbal teas. With these 4 DIY organic herbal tea bags beauty hacks, you can fully reap the benefits of your teas without any additional cost! Simply rely on the many tea bags in your pantry to amp up your beauty routine. If you’re not sure where to buy tea leaves, such as organic red tea leaves, look to nilufertea to buy teas imported from Japan. Shirley is a broke university student spending her summer holidays sipping on tea and watching Jennim videos.